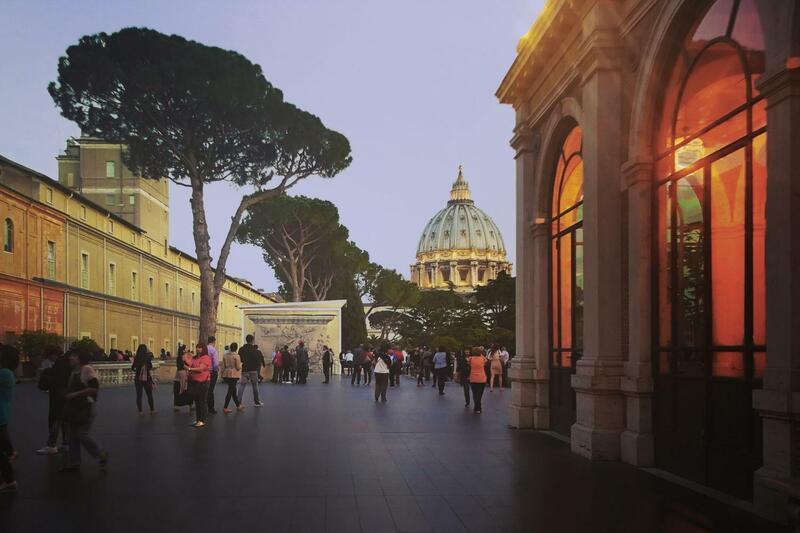 Three-course served dinner in a wonderful location overlooking St.Peter's Dome. Thourough explanations provided by a professional and qualified guide. Great occasion to visit the Vatican Museums at night with little crowd. Access to the Chandelier’s Gallery, the Tapestries Gallery, the Geographical Maps Gallery. 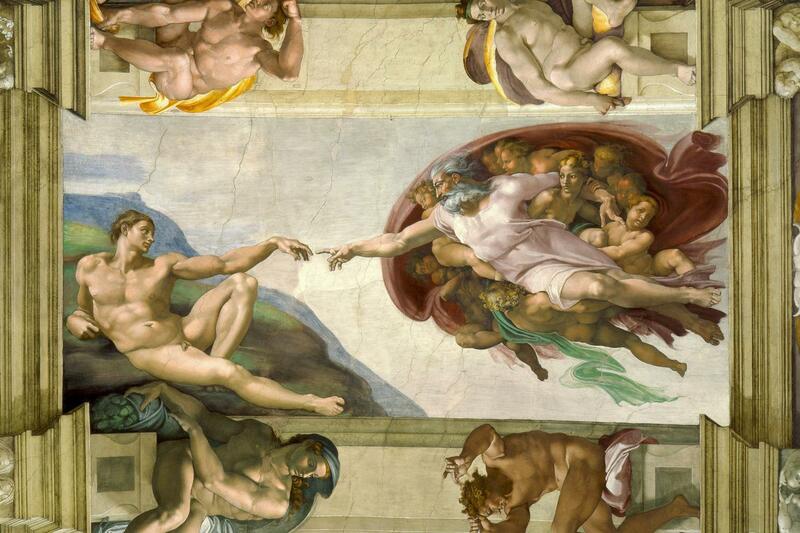 Exciting visit to the Raphael’s Room, the Sistine Chapel and the Vatican Library. The tour with dinner starts at 7:00pm. 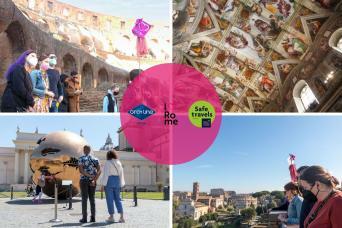 The meeting point is in Viale Vaticano 100, opposite the Vatican Museums entrance. The meeting time is at 6:30pm sharp. The meeting point is at 7:45pm sharp. Ohne Anstehen abends in den Vatikan - Essen mit einer kleinen Gruppe von nur 11 Personen in den vatikanische Gärten - Abendstimmung in Rom, einfach toll! 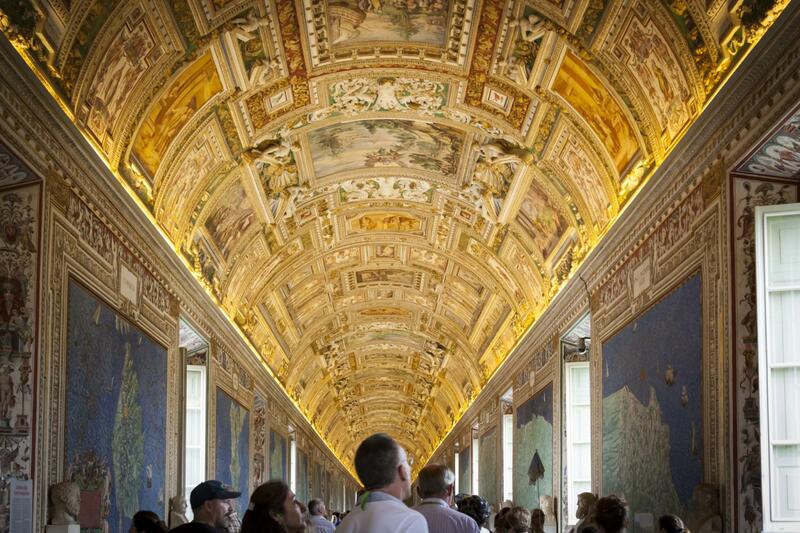 Vatican City may be the smallest country on Earth, but with nine miles of invaluable artwork kept in more than 2,000 rooms visiting it can be overwhelming, especially during the day. If in Rome for a long resting weekend, or even after a busy day at work topping your hard-working week, just indulge in a tour of one of the most important museums in the world led by a professional guide on Friday nights. 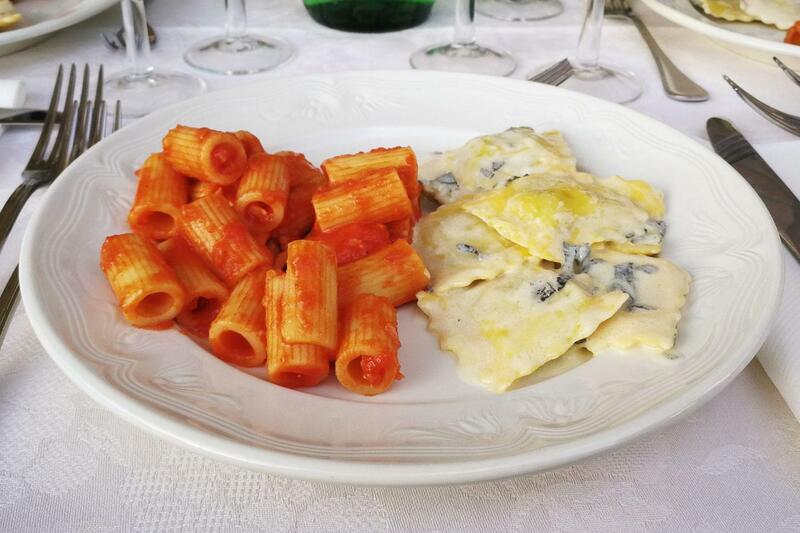 The tour starts with a special dinner in an exclusive location inside the Vatican City: you will have to pinch yourself when a tour assistant will take you to the so-called Giardino Quadrato for your outdoor meal overlooking St. Peter's Dome. But it will be no dream: designing unique activities so that our customers can live once-in a-lifetime experiences is our mission. After dinner, you will be led into the Vatican Museums, one of the most important places in the history of human civilization. 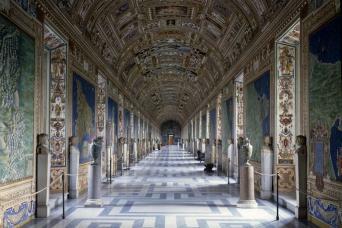 Get to know the important collections of art the various popes have acquired throughout the centuries. 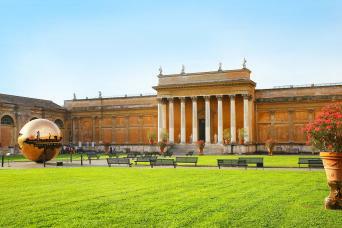 Look out for renowned sculptures and masterpieces of Renaissance art. Feel the weight of history and get a sense of the sacred as you spy paintings by Raphael, Giotto, Leonardo da Vinci, Caravaggio and Michelangelo, including his masterwork: the Sistine Chapel. Thanks to our special agreement as Tour Operator Partners of the Vatican Museums you will skip all lines, saving long waits that usually form outside this popular attraction. 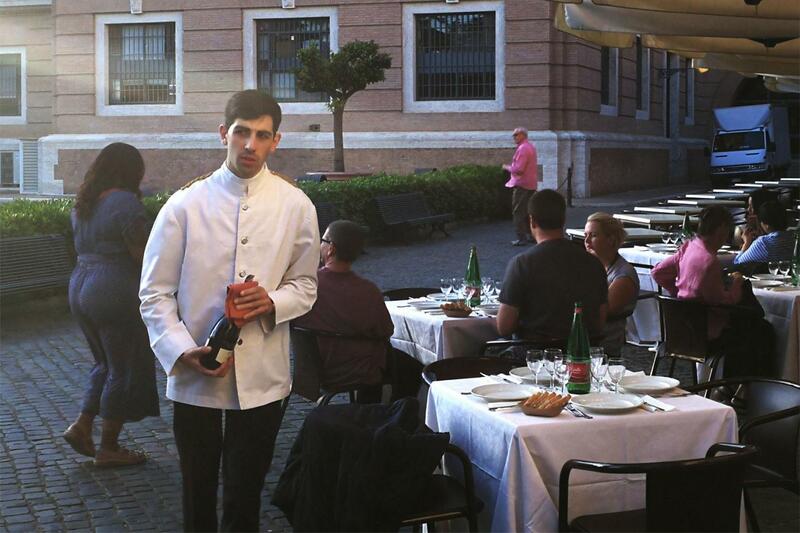 The meeting point for the tour with dinner is in front of Caffè Vaticano, Viale Vaticano 100, opposite the Vatican Museums entrance. Please be there no later than 15 minutes before the tour starts. Tour: start time at 6:45pm. The meeting point for the tour without dinner is in front of Caffè Vaticano, Viale Vaticano 100, opposite the Vatican Museums entrance. Please be there no later than 15 minutes before the tour starts. Tour: start time at 08:00 pm.